The Geoffrey Kaye Museum of Anaesthetic History worked with the School of Philosophical, Historical and International Studies, Faculty of Arts, Monash University, to create a full-day workshop for interested people to develop and enhance their skills in researching and writing about medical history. Dr Paula Michaels is a senior lecturer in modern history at Monash University with a special interest in medical history. In 2014 she published Lamaze: An International History, which looks at the issues surrounding birthing practices in Europe and America. Popular between the 1950s and the 1970s, Lamaze found its place in the medical landscape post World War II, during the Cold War, and second wave feminism. 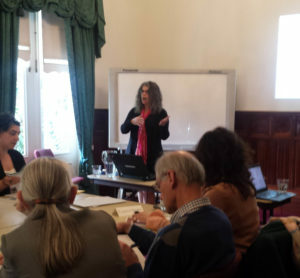 Paula was an ideal choice to construct a day-long workshop designed to help those interested in medical history to develop and refine their research and writing skills. 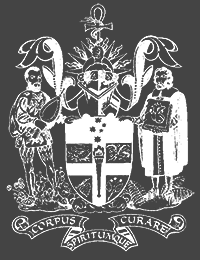 In Australia, much of what we know about medical history has been researched and written by enthusiastic amateurs, many of whom have had a professional life in the practice of medicine. Combining their natural enthusiasm with a solid set of skills could only produce stronger research. Of course, not everybody interested in medical history has a medical background. It was important to ensure the workshop was accessible to those people as well. We decided on a course structure that would incorporate some of the basics – understanding the difference between primary and secondary evidence, formulating a research question and how different sources respond to different questions. One special gem that stood out for the medical people was not to include the conclusion (aka results) in the introduction. Save the conclusion for the end (aka conclusion). We also thought it was important to explore the different styles required for medical writing and historical writing, this even included a quick investigation of the different referencing styles generally employed by these very different disciplines. In January 2016 I did a six week online course in medical history from Oxford University and yes, I did go around saying I was an Oxford scholar for those six weeks! 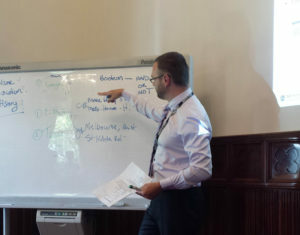 One of the areas of keen debate during the course was whether or not the history of medicine should be left in the hands of people who have no medical background. My response was to question whether or not the history of medicine should be left in the hands of people without any training in the humanities. Surely there’s room for both. Medical people have a considered and healthy respect for the history of their profession. Many learn snippets of the past within their formal training and many more rightly come to the realisation, of their own accord, that their profession has an important role in the history of humanity. Unfortunately, if you don’t have a medical background, some of the written histories are so heavily based on technical achievements they can be a little difficult to digest. And, Paula warned us very strongly against creating a complex chronology of events rather than a detailed and nuanced history. Our first exercise was to investigate the writings of David Oshinsky. We read through a chapter of Polio: An American Story. Oshkinsky won the Pulitzer for History in 2005 with this work and, as a group, we investigated the narrative style and looked at issues of convention, such as the amount of citation within the body of the work. He is a medical historian and yet there are elements of political history, economic history and social history within this one paragraph. This was an important exercise to help us all understand the value of keeping history accessible to a range of potential audiences. It is essential to know the audience you want to communicate with and adjust your language accordingly. The next exercise was to unpick a number of case studies from a 1950 study into anxiety during pregnancy and childbirth. As far as possible, participants with a medical background were paired up with participants without one. This allowed for different interpretations of the text to be drawn out as the groups worked through it. One group even mentioned the way they became stuck on a single word, concerned that the meaning they were attributing to the word wasn’t the meaning intended by the author some 60+ years ago. ANZCA Library Manager, John Prentice, treated us to some insider tips for searching the internet, library databases and other potential sources of material. John reminded us to “ask Mum”. Memory, while full of vagaries, is an interesting way to access common knowledge that isn’t so common anymore. The day finished with a workshop session. Some participants already had projects they were working and, with our new found skills, we broke into groups to develop ideas and strategy for progressing their research. All in all, it was a wonderful day. Highly instructional, helping us change and refine historical practice. But, also highly inspirational. Hopefully it is also the first of many.